As a long time Jersey Girl, you can imagine going vegan has been tough in terms of pizza. I can go to our local kosher pizza place and get meatless meat pizzas, but there's no where local that I can get a pizza with vegan cheese. Which to me is crazy, but it's way cheaper and healthier to eat vegan mozzarella than to eat regular mozzarella. Anyway, this was a super quick, we got home too late to make a real dinner, kinda dish. 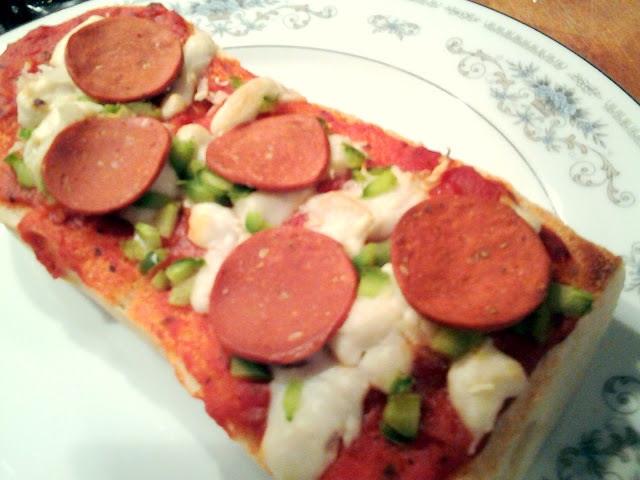 French bread...well, maybe it's more like an Italian roll....whatever...jarred sauce, onions, peppers, vegan pepperoni (truthfully, the Tyrant loved it, I thought it was okay) and vegan mozzarella cheese. "Note: This recipe is one of the most popular recipes on my site and is therefore one of the most copied/imitated. If you make this cheese and like it enough to blog about it, please have the ethics to respect me, my creativity and the weeks that I spent developing this recipe by simply linking to this post rather than sharing the recipe on your own site. -Somer"
So go to her site and check out the recipe! Recently, a slew of studies have come out from Harvard and what not, all talking about how we shouldn't be drinking milk. So if you don't care about those poor cows being forced to give birth over and over, and having their babies stolen from them, leaving them distraught and crying out for weeks because you lack empathy and compassion.....then maybe you should care about your own health and well being. Just saying. I'd link a bunch of studies, but they are long and not always an easy read. I hope this chart makes you at least think about what you're doing. Why are you continuing to eat and drink things that are making you sick? You should want better for yourself and the people you love.